PINES examines New England history and material culture from the seventeenth century through the Colonial Revival, and delves into building design and technology, and the wide-ranging lifestyles illustrated by the historic sites on the itinerary. 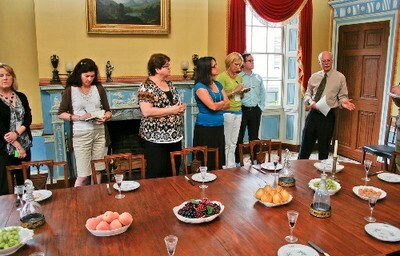 Highlights include private tours of Historic New England properties in Greater Boston; Essex County, Massachusetts; Portsmouth, New Hampshire; South Berwick, Maine; and Woodstock, Connecticut; workshops in furniture, ceramics, and textiles at Historic New England’s facility in Haverhill, Massachusetts; and a private tour of the Art of the Americas Wing at the Museum of Fine Arts, Boston, with curator Gerald Ward. PINES is designed to appeal to owners of historic houses, collectors, museum professionals, graduate students, and those who enjoy New England history, and is limited to twenty-five participants. Registration is $1,550, which includes all lectures, workshops, tours, admission fees, daily meals for breakfast and lunch, scheduled evening receptions, and transportation for site visits and excursions. Scholarships are available to mid-career museum professionals and graduate students in the fields of architecture, decorative arts, material culture, or public history. For more information or to register, visit Program in New England Studies, call 617-994-6629, or write Ken Turino.